Certificate of Appreciation to the Nambucca River Users Group (represented by David Banks, Chairman and Katie Adams, Secretary)—in recognition of the Group’s cleanup of the Nambucca River and Warrell Creek. Notice to Council $350,000 than change to $250,000. Can someone tell me the full cost—is it a one off or is it ongoing. Council has not discussed the matter but some documents have been given to Councillors. Defined Benefit Superannuation Schemes generally commenced before the introduction of the 9% superannuation guarantee in 1993. The Local Government Scheme commenced as the State Superannuation Scheme and prior to the introduction of the 9% guarantee was the means by which public sector employees in the State made provision for a “self-funded” retirement. The Defined Benefit Scheme for both State and Local Government employees was closed to new members in about 1993. Thistle Park sale from Education Department to Housing Department for residential development. Can Council stop this from happening as the area is flood prone and a water storage area? Could Council refuse a building applicant as Government has their own guidelines? Nambucca district Cricket Association has advised that their long term lease over Thistle Park has expired and that the owner, the NSW Department of Education intends to rezone the land and sell it for residential housing. 1 Thistle Park is owned by the NSW Department of Education and was designated as the future site for Macksville East Primary School. 2 In 1996 it was leased to the Nambucca/Bellingen Cricket Association. The Cricket Association has surveyed, filled, levelled, drained, turfed and irrigated the area at a cost of approximately $70,000. This figure does not include approximately 600 hours of voluntary labour to establish the ground and approximately 10 hrs/week maintenance for 30 weeks a year over the past twelve years. 3 Under Section 555 of the Local government Act “land that belongs to and is occupied and used in conjunction with a school…including (i) a playground that belongs to and is used in connection with the school..” is exempt from all rates. 4 As a result of the Cricket Association developing and maintaining Thistle Park, the local public schools have been able to use it for sporting activities. This use by the schools has allowed the Department to claim exemption from rates under Section 555 of the Local Government Act. 5 There are five senior and junior cricket teams in Macksville and with only two grounds remaining in the town, club members will be faced with a lot of travelling. Thistle Park is also used for representative games for seniors and juniors; and the seniors host the North coast Games, Country Cup Games and the annual games against a touring New Zealand emerging Players team. Thistle Park is also host to all semi finals and grand finals and is very much the centre of cricket in the area. 6 It may also be worth noting that this Club and this field was the training and development ground for Australian Cricketer, Phillip Hughes. 7 given that through the indirect efforts of the Cricket Association, the Department has held the land rates free, it does not seem unreasonable to request some assistance from the Department in covering the costs of relocating the cricket pitch. 8 Given that Macksville will continue to grow and the need for quality public education remains, it does not seem unreasonable to request that profit from this land sale remain in public education in Macksville. Outcomes of meeting to come to Council in a report in May 2009. Deferred to April 2009. Report in business paper. Report to GPC 15 April 2009. To be listed for April GPC. Report listed for GPC. Deductible Gift Recipient Status approved 3 April 2009 by the ATO for Macksville & Nambucca Heads libraries. Allows Council to receive donations for libraries which are tax deductible to donors. Becomes effective 1 July 2009. 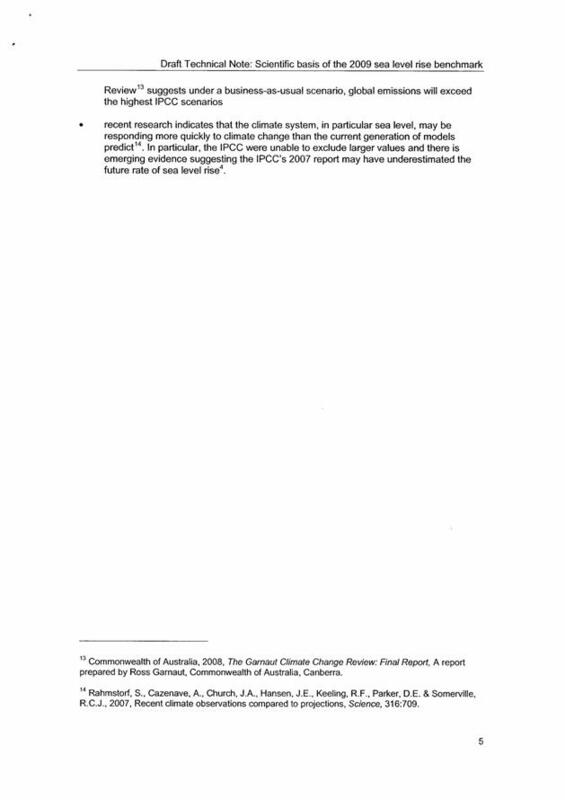 Report to 16 April 09. To be reported with Draft Master Plan. Enquiry made with Scotts Head Reserve Trust on 6 April re insurance and payment. but no change to the proposed cricket fields. The exhibited cricket field layout has been adopted. The Department of Local Government have advised of the release of the revised Local Government Filming Protocol and request a nominated Contact Officer. This Protocol sets out the way film permits should be processed by Councils. The Protocol is intended to foster understanding between industry and stakeholders to simplify procedures and build a good working relationship to NSW as a whole. 1. 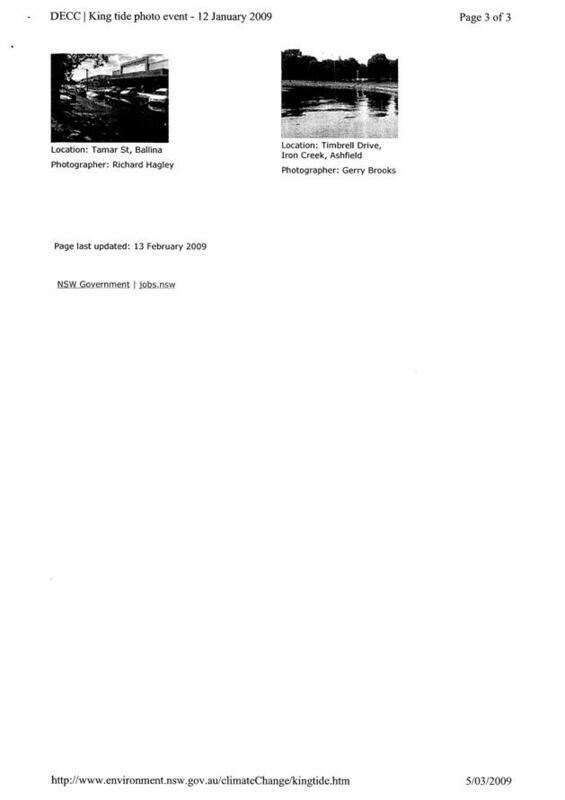 In a Circular to Councils 09-11 dated 23 March 2009 the Department of Local Government advised of the release of the revised Local Government Filming Protocol (the Protocol). 2. The Council was advised in a Circular in 2008 Making NSW Film Friendly, the Film Related Legislation Amendment Bill 2008 was passed by Parliament on 18 June 2008 and was awaiting assent pending a review of the Protocol. The Act will commence on 30 March 2009. 3. It is expected that Councils will provide the highest possible level of cooperation with Film Makers. 4. The Protocol makes the film process easier for both the film makers and Councils, giving all Councils one set of rules for processing approvals and also formalising a Code of Conduct for the screen industries, designed to ensure that the filming is sensitive to community needs. 5. The Department advises that Councils must comply with the Protocol. Councils can only opt out of this Protocol by adopting a satisfactory alternative approved by the Director General of the Department of Local Government. An alternative will only be approved if it supplements the Protocol. 6. The Protocol has been revised in consultation with the Local Government and Shires Associations of NSW and a number of Councils with experience in film activity. It aims to achieve a balance between the interests of Councils and Communities while supporting the film industry. 7. Councils are required to nominate a Film Contact Officer who will assist filmmakers in obtaining the necessary approval, support and access to Council services. The Protocol will provides details on the role of this position. The NSW Film and Television Office will offer training and ongoing support to the Film Contact Officers and Councils. 8. Ms Christina Hyde, Manager of ScreenLinks will be meeting with the General Manager to discuss the process of implementing the Protocol in the near future. 9. The Department of Local Government will review the Protocol after two years of operation. 10. Council may wish to introduce a fee for processing applications, services provided to support location filming, for the use of Council controlled and managed land, and in situations where filming has a clear, identifiable negative impact on public amenity. There is no environmental implications. Improvement of social impact of film and television production locally and to be utilised as an industry development initiative. Designed to deliver consistency in film and television production across the region to stream line the application process between Council boundaries creating economically viable film production. The report acknowledges the Annual General Meeting of the Committee of Management for the Valla Beach Urban and Hall and the new Committee. 1 The Annual General Meeting of the Valla Beach Urban and Hall Committee of Management was held on Monday 16 February 2009. Committee Members Aldo Schepis; Cath Niezgoda; John Windmill. Council at its meeting on 2 April 2009 deferred this matter to the meeting of 16 April 2009. Council has been advised by the Gene Technology Regulator of an application from Florigene Pty Ltd to propagate and grow the modified roses for sale as cut flowers throughout Australia and have invited feedback on a risk assessment of purple/blue roses which have been modified using gene technology by 6 May 2009. 1. This matter was deferred from Council’s meeting on 2 April 2009. 2. An invitation has been forwarded seeking feedback on a risk assessment of purple/blue roses which have been modified using gene technology with submissions closing 6 May 2009. The market would seem to have a preference for purple/blue coloured roses over pink roses. 3. Florigene Pty Ltd has applied to propagate and grow the modified roses for sale as cut flowers throughout Australia. A Risk Assessment and Risk Management Plan (RARMP) has now been prepared for public consultation which provides a comprehensive, science-based evaluation concluding that the proposed commercial release poses no significant risk to people or the environment. Some general licence conditions are proposed to ensure that there is safe oversight of the ongoing release. 4 Council may know of local issues relating to the health and safety of people and the environment that the Gene Technology Regulator should take into account. A letter is attached from the acting Gene Technology Regulator explaining the process. The Executive Summary of the consultation RARMP, a set of Questions and Answers and a summary feedback on the application are also attached for information. A full consultation RARMP and the Risk Analysis Framework, which guides the assessment of licence applications, are available from the website www.ogtr.gov.au (under “What’s New”). The RARMP will address any potential environmental issues. There is no impact on the current and future budgets. This Policy was last reviewed in July 2008, and has again been reviewed as per Item 15 of Outstanding Actions and Reports dated 6 November 2008. The Policy remains the same except for adequately defining the applicants obligations in providing a Bank Guarantee as security. 1.1 Given the importance of developer contributions towards the provision of infrastructure and services, the conditions whereby deferment of payment will be considered need to be clearly expressed and consistently applied. A key consideration for Council will always be the impact any deferment will have on Council’s cash flow and the ability for Council to meet its obligations in the provision of community assets. d. the arrangements to be entered into so as to guarantee payment to Council in circumstances where the applicant defaults. 1.3 Council has the authority to grant contribution payment deferment under certain circumstances. The circumstances by which contributions may be deferred must be prescribed in the s.94/64 Developer Contribution Plan and should be supported by an adopted Council policy. 1.4 This Report provides advice concerning the adopted Council policy on the deferment of contributions. 2.1 Council adopted the current Contributions Policy on 19 October 2006 and subsequently reviewed it on 16 July 2008. 2.2 Summarised, the Council adopted policy states that Council may choose to accept deferred or periodic payment of contributions where the applicant can demonstrate particular circumstances, and where the application to defer the payment of contributions is made in writing. An application to make payment based on progressive land sales, or family reasons is not considered an acceptable circumstance. Deferment of contributions will not be considered for a period greater than 12 months and is subject to a bank guarantee being provided as security. 3.1 The adopted policy states the requirements an applicant must meet in applying for deferred or periodic payments of contributions, however the policy does not adequately define the applicants obligations in providing a bank guarantee as security. 3.2 The following amendments to the current policy are suggested to assist in clarifying these obligations and to reduce any unintended ambiguity. f. where a bank guarantee has been deposited with Council, the guarantee shall not be cancelled until such time as the original contribution and accrued interest has been paid. Councils Finance Manager and Accountant have been consulted. Section 94/64 Plans generates income as a result of development and the associated additional needs. Section 94/64 Developer Contributions represent a significant income stream for Council. As such this plan offers considerable financial and resource benefits over the immediate and mid term. To ensure the payment of contributions pursuant to Section 94 of the Environmental Planning and Assessment Act 1979 and Section 64 of the Local Government Act are paid in a timely manner and no prejudice is caused to the operation of the contribution plans. Council will accept a deferred or periodic payment of contributions subject to the contribution being secured by Bank Guarantee and the deferment being no longer than twelve months. In such a case the applicant must make a written request. · At the time of issue of occupation or interim occupation certificate, subdivision certificate or where no such certificates are required prior to the issue of an approval. Council may choose to accept a deferred or periodic payment of contributions required as Section 94 or Section 64 Contribution Plans where the applicant can demonstrate that the circumstances of the case make the requirements of the above conditions for payment of contributions unreasonable. · The provision of the infrastructure in accordance with the adopted works schedule will not be adversely affected. An application for deferment based on progressive land sales is not considered an acceptable circumstance. An application for deferment for family reasons is not considered an acceptable circumstance. · The payment of contributions before the expiry of the deferred period will not result in an adjustment to the increase in the contributions by the CPI as stated in dot point two. · Periodic payments for a staged development will be on a pro rata basis - the proportion of the stage of the development is to the overall development. The report discusses insurance arrangements for the use of Council land adjoining the Scotts Head Reserve and particularly for an annual camp conducted by the Scripture Union Family Mission. There are no real options. 1. What policies does Council have with the Lands Department on the lease area of the Nambucca Shire Council? The existing lease of the land has expired and the use of the land as a caravan park is continuing on a month by month basis under clause 12.4 of the lease. The Trust is responsible for insurance on this land. This situation is not sustainable as it effectively precludes the opportunity for private sector finance to redevelop the caravan park. This of course is a major consideration in the draft Master Plan which has recently completed public exhibition. There has been a practice in place for many years whereby the Scripture Union Family Mission has had between 20 and 35 people camping on the edge of the cricket oval (outside the land leased to the Trust) between 27 December and 7 January. They pay a nominal per head fee to the Scotts Head Reserve Trust for the use of the amenities in the caravan park and provide a donation of $400 to the Scotts Head Junior Sports Club. The question of insurance has been raised with the organiser of the Scripture Union Family Mission who advises that the Mission has public liability insurance. “The cricket field excluding the pitch area can be used for event camping if Council approval is given. Whilst there is the likelihood that the camping would be covered by Council’s own public liability insurance, as Council is not receiving any fee for the use of the oval for camping the preferred arrangement is that Council cite the public liability insurance for the Scripture Family Mission with Council to be noted as an interested party. This is answered in two. There has been consultation with the Scotts Head Reserve Trust and the Scripture Family Mission. There is unlikely to be any insurance risk, however to be sure it is recommended that Council cite the Scripture Union Family Mission public liability insurance with Council to be noted as an interested party. 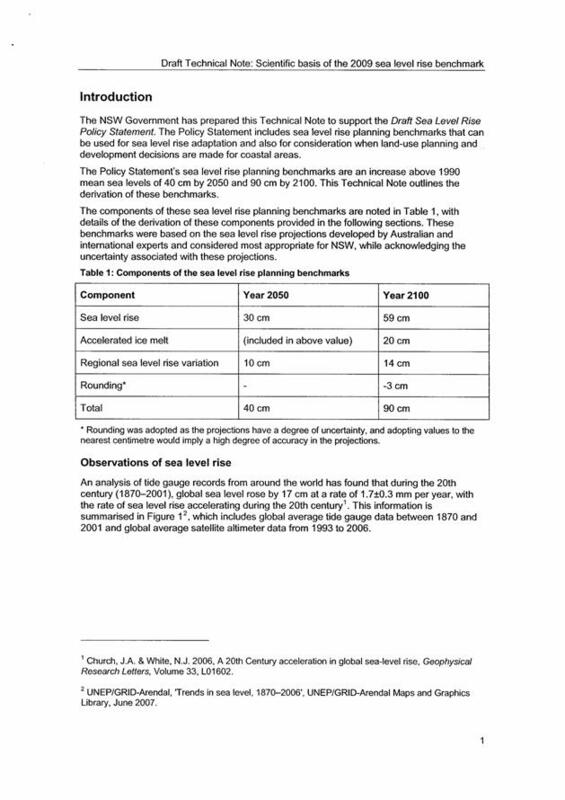 The NSW Government released their Draft Policy Statement on Sea Level Rise on 24 February 2009 (attached), which sought comment from Council's, agencies and the public by 3 April 2009. The Draft Policy has adopted the projected rise for the NSW Coastline of up to 40cm to 2050, and 90cm to 2100 on the 1990 mean sea levels. 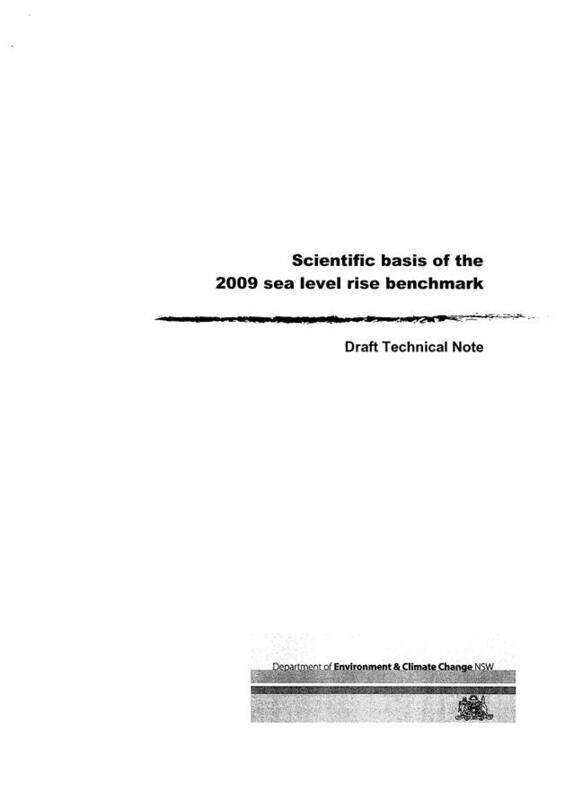 A Technical Note has also been issued with the Draft Policy Statement which supports and provides the Scientific Basis for the 2009 sea level benchmark projected sea level rise (attached), as well, the king tide event on 12 January 2009 was also referenced by DECC in their letter to Council, which is also attached. 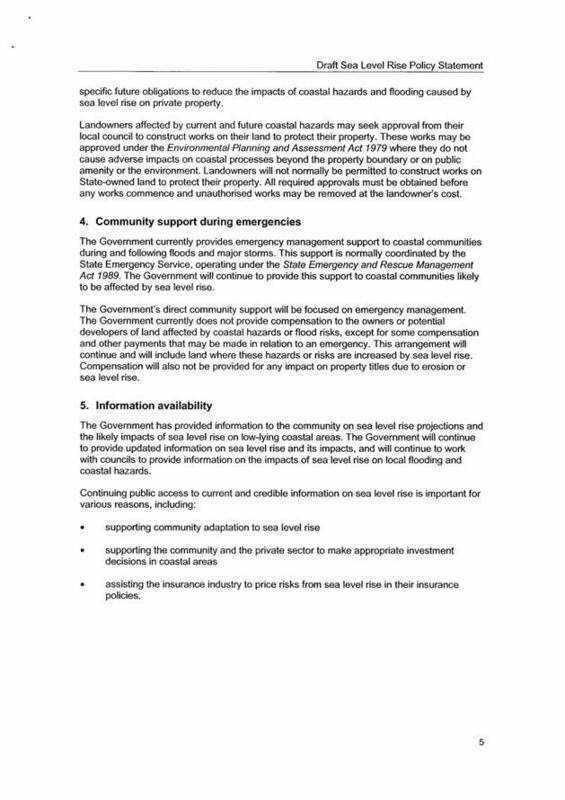 Council has sought advice from its Insurers in regard to the Draft Policy Statement and is also attached. A response was sent in regard to the Draft Policy Statement in response to the 4 specific questions raised with a request for an extension of time as the matter is not being submitted to Council until 16 April 2009. 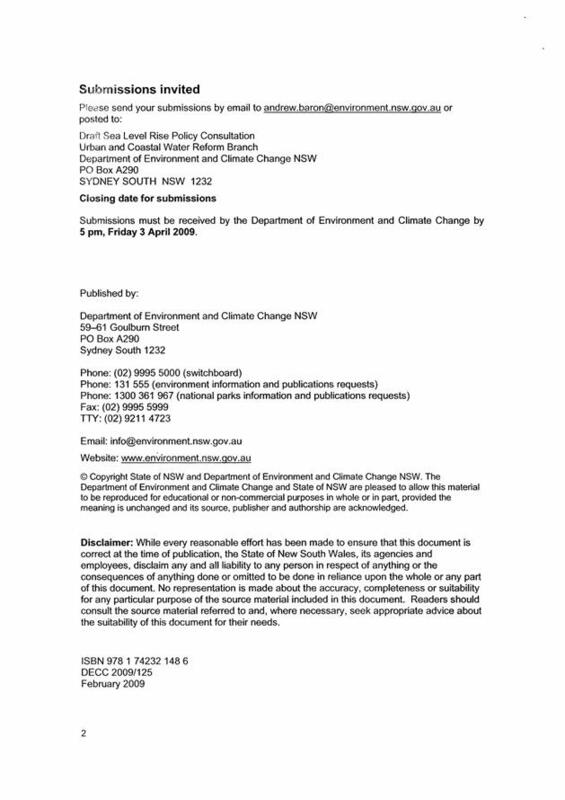 4 That Council seek a legal opinion on how it should advise the effect or impact of the NSW State Government Policy Statement on Sea Level Rise under Question 7 on a Planning Certificate (S149) where Council has limited information on land that may be affected by a sea level rise of 40cm to 2050 and 90cm to 2100. 1 There are no real options available to Council in regard to its statutory or risk management responsibilities. 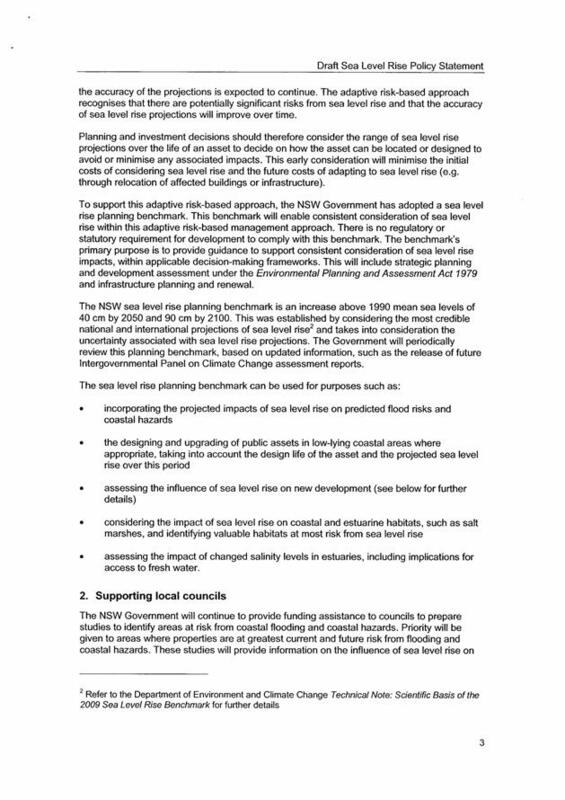 2 Council could choose not to adopt the predicted sea level rise out outlined in the NSW Draft Policy Statement on Sea Level Rise. 3 Council could choose to make a further submission in regard to the draft Policy Statement and if so, identify the issues to be included in the submission. 4 Council could choose to take stronger action in its pursuit for financial assistance through the State and Federal Governments. 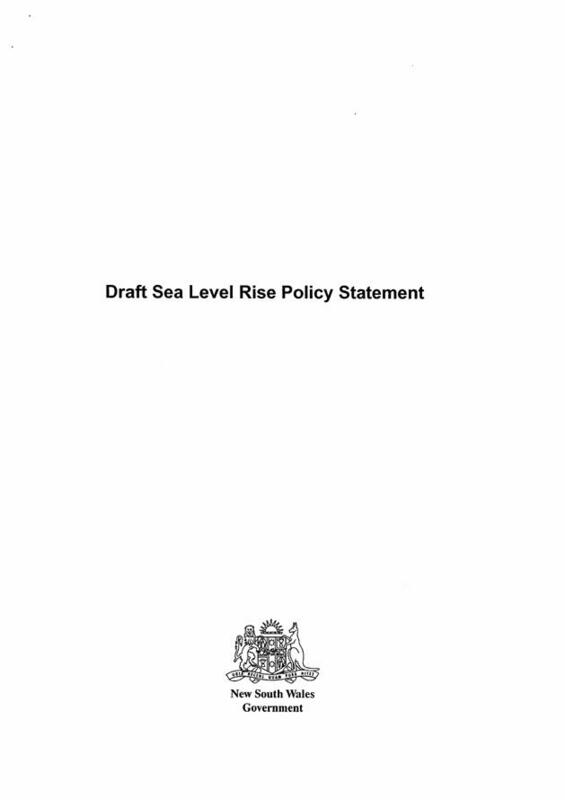 After considerable pressure and requests for guidance, the NSW Government through the Department of Environment and Climate Change have issued a Draft Policy Statement on Sea Level Rise which is accompanied by a Draft Technical Note which provides support for the Draft Policy Statement. 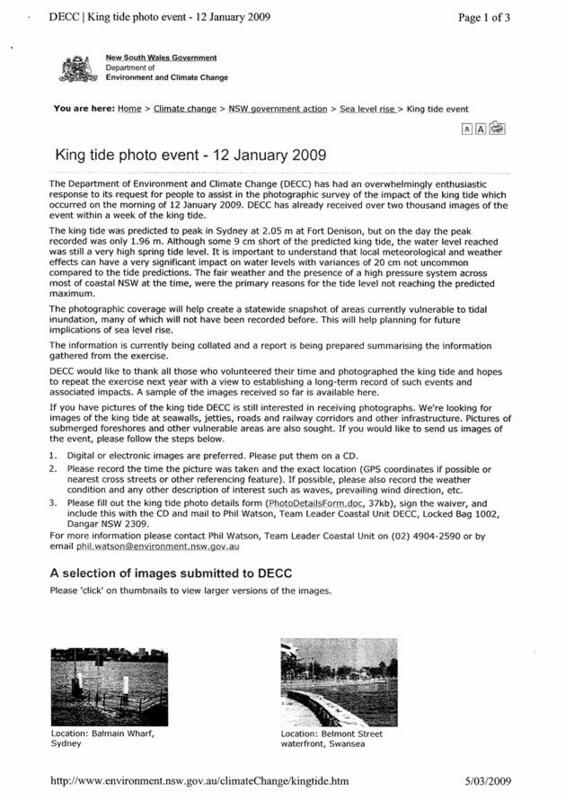 Advice was received in late February of the Draft's release and requests for comments by 5.00 pm 3 April 2009. A response was prepared and is attached for Councillors information. It being noted that a request for an extension of time to enable Council to consider the matter, the response from Council's insurer and the timing of Council meetings was sought. Based on advice from the Intergovernmental Panel on Climate Change and CSIRO reports, the NSW Government have endorsed the projected sea level rise (relative to 1990 mean sea levels) for land use planning and coastal investment decision-making of up to 40cm to 2050, and 90cm to 2100, for the NSW Coastline. 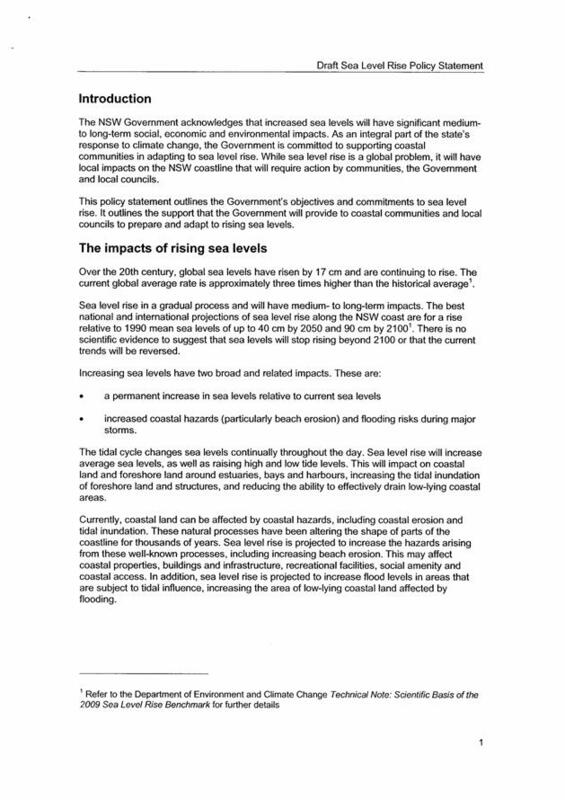 In the letter of advice regarding the Draft Policy Statement from the DECC it states "the draft Policy Statement includes sea level planning benchmarks which have been developed to support consistent consideration of sea level rise in land use planning and coastal investment decision-making….. 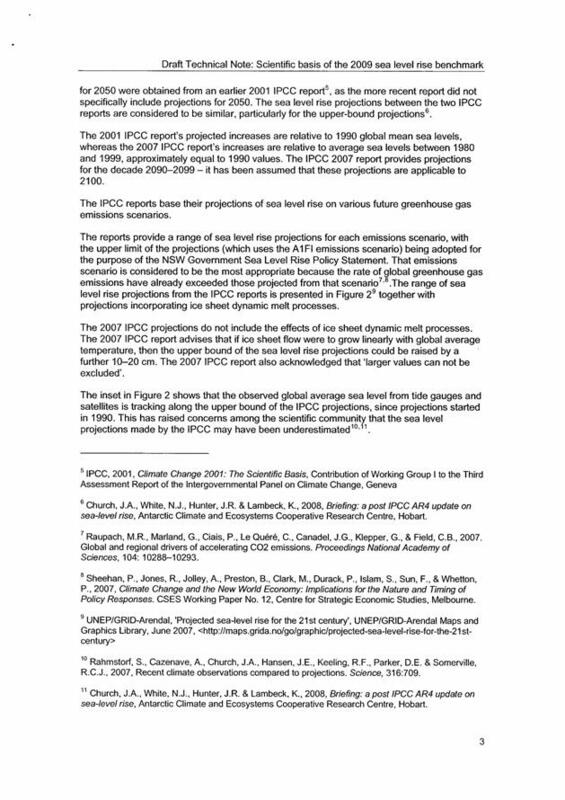 These benchmarks represent the Government's guidance on sea level rise projections for use in decision-making and are not regulatory standards"
After considering the statements above by DECC that the identified sea level rise is for guidance not a regulatory standard, Council sought advice from Statewide as to how they and the insurance industry generally will deal with the Policy Statement. With the release of the NSW State Government Draft Policy Statement on Sea Level Rise and the advice from Statewide, it is important that Council embrace the predicted sea level rise of up to 40cm to 2050 and 90cm to 2100 in all its strategic and statutory land use planning considerations and decision making processes as well as for the design and investment in coastal and estuarine infrastructure. As Council would be aware, Section 149 Certificates (zoning/planning certificates) require Council to indicate known risks associated with land. 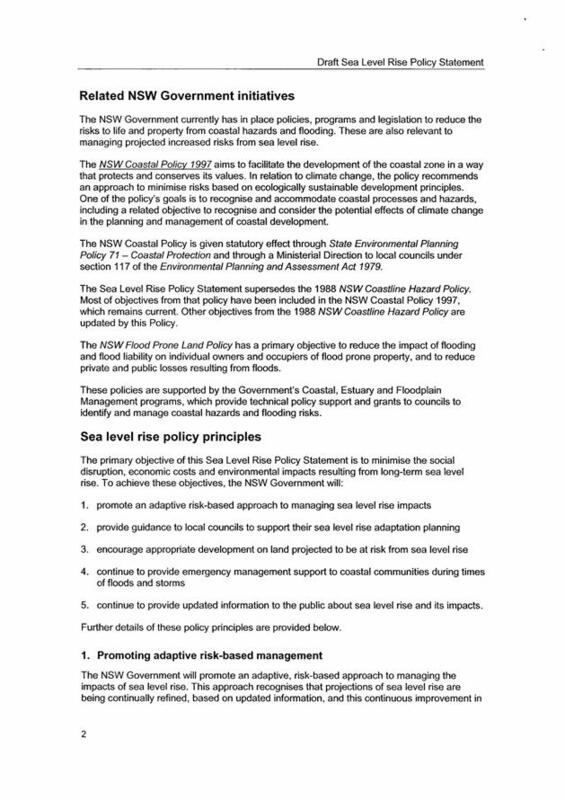 With the release of the Draft Policy Statement on Sea Level Rise which provides a planning benchmark of 40cm (2050) and 90cm (2100) sea level rise, Council is required to identify the land which may be impacted upon and state this on the Certificate. However, the limited information that Council has on the impacts and the areas which are likely to be affected due to sea level rise, is of concern as Council is not in a position to clearly identify encumbered land forcing Council to apply the precautionary principle in its response to this specific question on the Section 149 Certificate. It is also likely to impose a considerable cost onto any person proposing development within or adjacent to the coastal strip, foreshore, riverine of floodplain areas of the shire as they will be required to identify the sea level rise impact. Advice to hand suggests that it is not a simple addition of 40cm or 90cm to existing flood planning levels to determine new areas of inundation or areas likely to be affected. New modelling is required for all current flood studies and modelling that has been done due to the impact of both sea level rise, sea surge and rainfall. The costs associated with such work is estimated to be $200,000 - $300,000 for both the Deep Creek estuary and the Nambucca River and its estuaries. It is suggested that Council seek financial assistance from both or either State and Federal Governments under their relevant floodplain, estuary and coastal funding programs. Climate Change and its associated natural processes and occurrences including Sea Level Rise is well documented and accepted throughout the world. The release of a Policy Statement provides Council's and the community clear guidance to minimise these environmental impacts on the natural, built and human environments. The sea level rise planning benchmark will assist Council in its future identification of areas considered vulnerable or at risk to inundation, such as floodplains, estuarine habitats, salt marshes and possible increases in salinity levels in fresh water wetlands and swamps. The Policy Statement provides some guidance, knowledge and protection for the community with the identification of predicted sea level rises over the next 50 and 100 years. Especially areas used by the public (foreshore or riverine open space areas), public infrastructure as well as private property. The impact of sea level rise on current infrastructure and property (public and private) will have significant economic impact for all levels of government and the community. 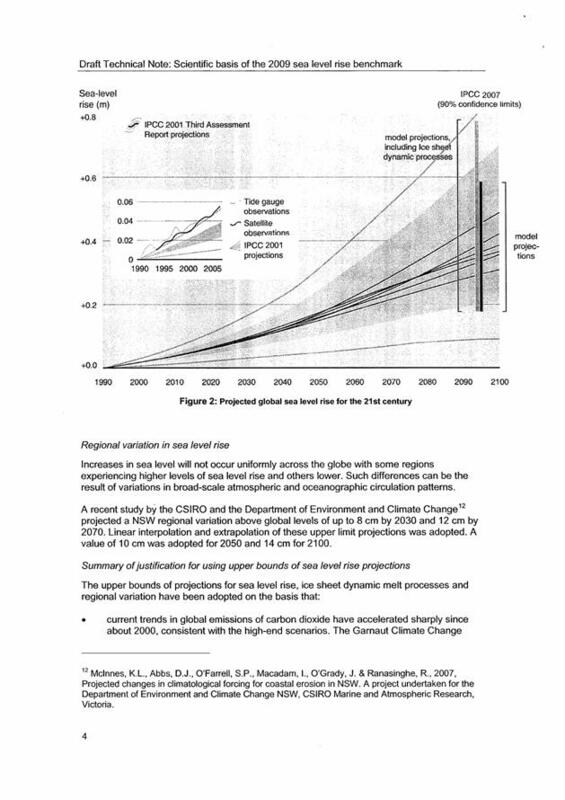 A much greater impact however, will occur by not embracing and planning for the predicted sea level rises. Whilst the State Government offers funding through its Coastal, Estuary and Floodplain Management Programs to assist Councils, it is normally on a 1:1 (State:Council) basis or at best 2:1 for Flood Studies. The risks associated with Climate Change generally, and specifically with increase in sea levels are enormous. Local Government has been seeking direction from the State Government on planning levels or benchmarks for predicted sea level rise and now that it has been provided the risk of not embracing and planning for sea level rise will place Council in an uninsurable position as outlined by Statewide. The source of funds can only be provided through General Fund or from the Environmental levy. I refer to the Draft Policy Statement apparently on exhibition, and wish to make the following comments in regard to the four specific questions raised in the DECC letter dated 24 February 2009. 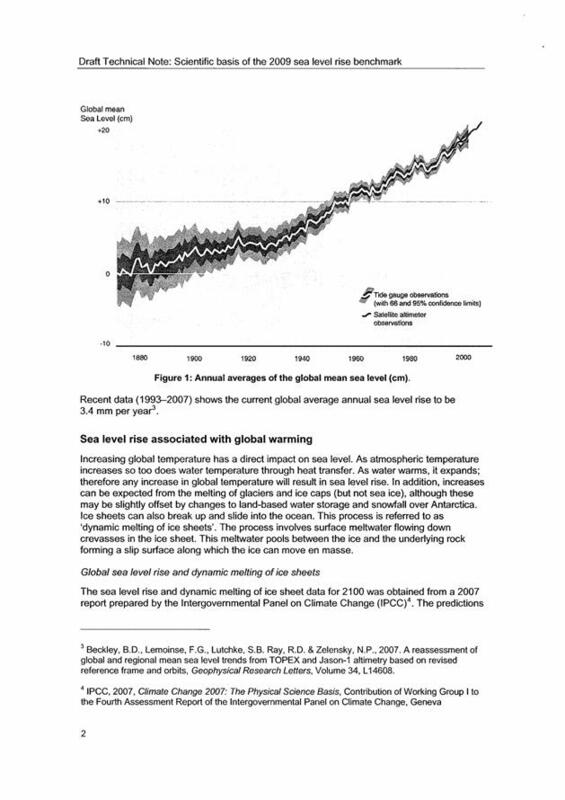 1 Council does not have any comment in regard to the benchmarks derived from the reports as the 40cm to 2050, and 90cm to 2100 are well-documented and accepted predicted sea level rises. 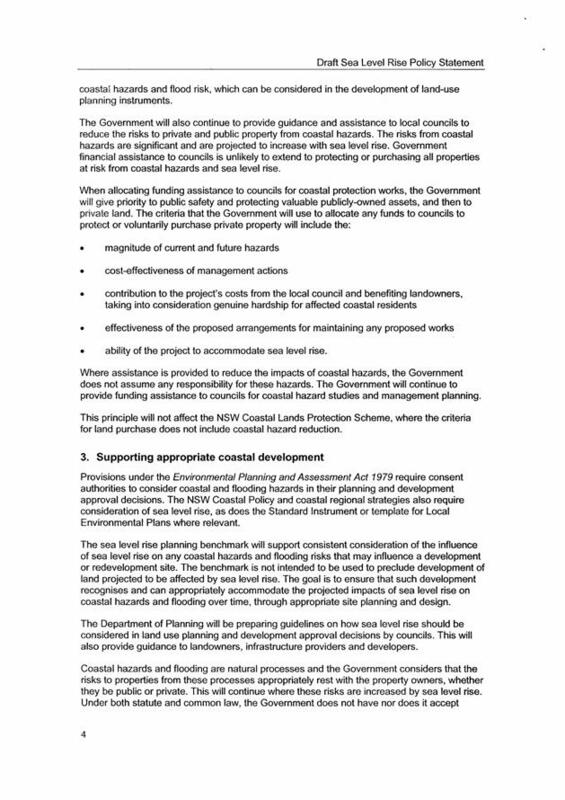 2 Council has previously resolved to seek a direction from the Minister of Planning in regard to specific regulatory standards or levels to provide certainty for Councils, landowners and the development industry on clear no go zones likely to be affected by sea level rise. The Draft Policy Statement clearly identifies they are guidelines only and are not regulatory standards which continue to provide some uncertainty as to the strength of the predicted sea level rises. 3 Further to 2 above, Council considers that the 40cm and 90cm predicted sea level rises should be regulatory standards and not guidelines. Nambucca Shire Council is one of a number of smaller coastal rural Councils who do not have up-to-date and state-of-the-art geographic information systems (GIS) and LIDAR survey data that can be used to predict and assist Council in identifying areas affected by sea level rise and increased flooding over the floodplains of the Nambucca Shire. In addition, guidance is sought with the wording on Section 149 Zoning Certificates to identify the Policy Statement on Sea Level Rise and the predicted 40cm and 90cm rises. 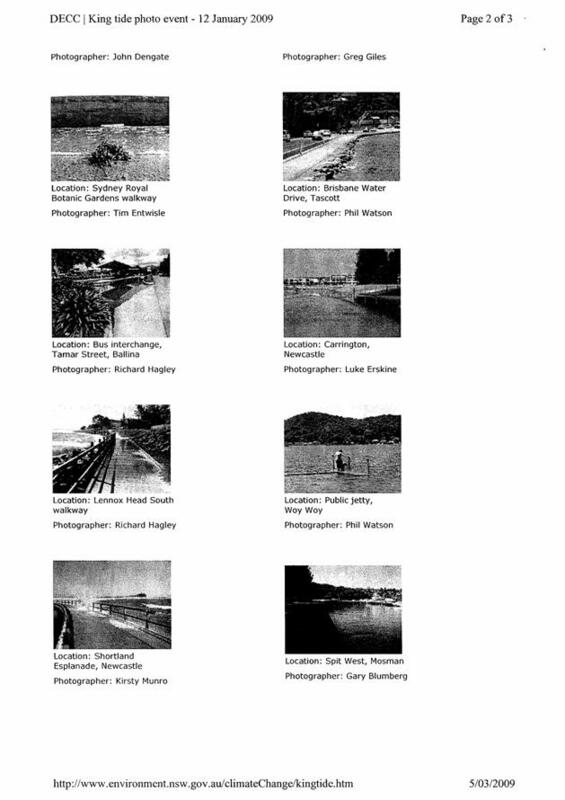 4 Nambucca Shire has sought advice from its Insurance Brokers Statewide, as to their interpretation and application of the identified sea level rises outlined in the Draft Policy Statement, to assist Council further with its duty of care, design and investment with its infrastructure and wording on its 149 Certificates as mentioned above. A report is to be prepared for Council’s consideration at its Ordinary Meeting of 16 April 2009 as we have been awaiting the response from Statewide. I therefore request that Council be afforded an opportunity to lodge a further submission on Friday 17 April 2009 should Council resolve to add to this submission. § Privacy issue with downstairs windows and roof drainage. 9/03/09 Additional information being sought from applicant. Application likely to be determined by end of April. § Concerns with stormwater run off and privacy. The figures show a 31.25% decrease in the number of DA’s received for July 2008-March 2009 with construction costs decreasing by 11.67% compared to the same period in 2007/2008. The total number of DA’s/CD’s approved for the month of March was 27 plus 9 modifications.